Space Shuttle Endeavour 'Launches' on Last Journey Through L.A.
Space shuttle Endeavour as seen as it arrived at The Forum in Inglewood, Calif. on Saturday, Oct. 13, 2012. The Forum hosted a formal sendoff for the shuttle on its final journey to the California Science Center for display. LOS ANGELES — Landing day has come for the space shuttle Endeavour, but instead of returning to a NASA landing strip after circling the Earth, the shuttle's runway is the streets of Los Angeles leading to its final museum display. The youngest of NASA's now-retired winged orbiters is set to complete its two-day road trip to the California Science Center (CSC) on Saturday evening (Oct. 13). It received a formal sendoff on its final "orbits" of "Mission 26: The Big Endeavour" — as the science center has dubbed the 12 mile (19 kilometer) journey — on Saturday morning. Before a crowd of tens of thousands of public spectators, Endeavour rolled up Manchester Boulevard to The Forum, the former indoor arena of the L.A. Lakers, where a half-hour program celebrated its homecoming. Endeavour, like its sister space shuttles in NASA's former fleet, was built in Southern California. Astronauts, including Apollo 7 pilot Walt Cunningham and Endeavour's last pilot Greg H. Johnson, as well as at least one Hollywood space traveler, June Lockhart of TV's "Lost in Space," turned out for the shuttle ceremony. "You know when I was in 'Lost in Space' I certainly never could have dreamed that we were going to have an event like this, right here in our Inglewood," Lockhart said. California State Senator Roderick Wright, in echoing some of the sentiments shared during the event by his fellow speakers, elected officials including Inglewood Mayor James Butts and Congresswoman Maxine Waters (D-CA), emphasized the reasons Endeavour came to California for display. "The reason that we are having this ceremony and the reason that we are going to locate [the space shuttle] at the California Science Center, is because we want you to know, every young person here in the audience, that the universe is your limit. You can go as high as you choose to go." Wright cited Inglewood's legacy as the birthplace of the aerospace industry as the inspiration behind Endeavour's arrival. "The Endeavour was born here," he said. "The Endeavour was [assembled] between Palmdale and Downey. There were parts made in Inglewood and Long Beach. Southern California made the Endeavour. Southern California gave the Endeavour to the world and this morning, here in the great city of Inglewood, we have the opportunity to say 'Welcome home.'" "For this moment, I would like to presume to be the voice of Endeavour," Lockhart said. "I embrace you all as you nurture me on this trip. I delight in the fact that my value was only increased since you drove me off the lot!" Arriving at The Forum in Inglewood at 7:30 a.m. PDT (10 a.m. EDT; 1400 GMT) to the recorded fanfare of "Also sprach Zarathustra," the theme to the 1968 movie "2001: A Space Odyssey" Endeavour, atop its modified NASA overland transporter, had already navigated the more than 3 miles (4.8 km) from Los Angeles International Airport, where it arrived atop a NASA jumbo jet last month. Much of Endeavour's day Friday was spent parked, first at a shopping center and then next to the landmark Randy's Donuts as crews worked to de-energize and raise power lines blocking the vehicle's path. The remainder of the shuttle's route was earlier cleared of such obstacles. Power lines were restrung on higher utility poles, traffic signals were lowered and hundreds of trees were cut down. The California Science Center Foundation will replace the lost trees with four for every one removed. 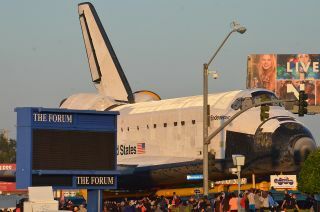 Endeavour's stop at The Forum was one of three public viewing opportunities planned for the day. On Saturday afternoon, the shuttle will be at the center of a celebration at the intersection of Martin Luther King, Jr. and Crenshaw boulevards. "Fame" actress Debbie Allen choreographed for the event a tribute to Endeavour involving dancers and aerial performers. The third and final viewing location is at Exposition Park, where Endeavour will arrive at its new home, the California Science Center. Expected after nightfall, the shuttle will enter the CSC's Samuel Oschin Space Shuttle Endeavour Display Pavilion, where the orbiter is set to go on public display on Oct. 30.